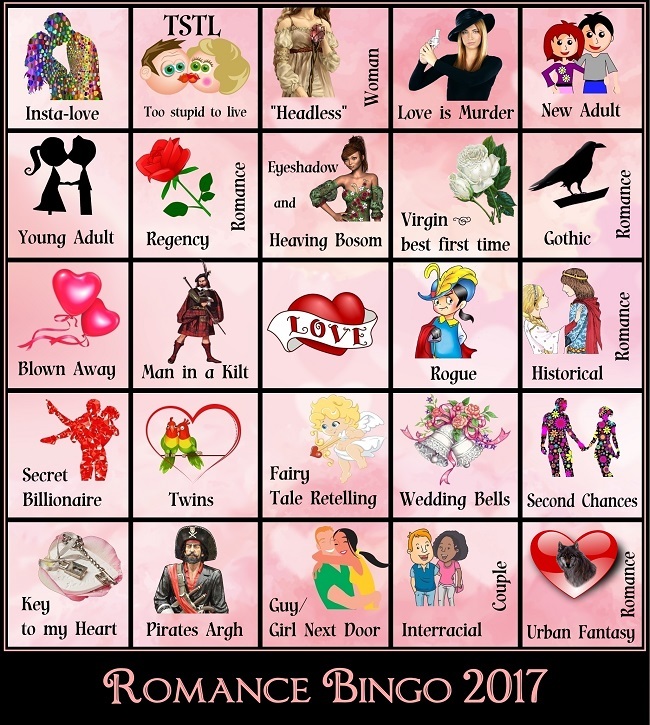 I will definitely be participating in this Romance Bingo, as my reading diet consists of mainly romance novels anyway, I'm sure getting a BINGO won't be hard to do. Getting a BLACKOUT might be harder since there are some categories here I don't normally touch, such as 'New Adult' or even 'Urban Fantasy.' But we shall see how this turns out. -- This book is one I'm also planning on including in my 2017 Reading Assignment Challenge, so it will count for both. -- I suspect that this will be the perfect square for my beloved Romantic Suspense books, no matter what I choose to read. -- I don't really read New Adult, but I DO know of one or two I've read that I liked. This might be a reread category. Although recent revelations have made me aware that Pride and Prejudice by Jane Austen was the original New Adult novel. I may have to jump on that one. -- Kasie West's next book will be published on January 31, and I'm an avid reader of Kasie West. I've never truly been able to really like YA Romances, so if I can't get my hands on By Your Side before the end of the Bingo duration, I may just reread an old Kasie West favorite. -- Ever since reading a review about a book by Tessa Dare, I've been interested. I plan on using this book for this category as well as completing the rest of the Spindle Cove series and seeing where else the rest of the books can be inserted. -- I have a few ideas for this one. One of the books being a Tessa Dare book, also probably from the Spindle Cove series. But I haven't decided yet. -- See 'Insta-love.' Because this category is also fairly par for most Category Romances, especially the old school romances from Harlequin where every heroine is innocent and virginal. Historical Romances will be an excellent place to find one of these! -- This book is also another I have chosen for my 2017 Reading Assignment Challenge. -- This category will also take some looking into. -- This is actually still a very tentative choice, because I don't know if I will be able to get to it. This is the third book in Dare's Castles Ever After series. Depending on the rest of my Bingo choices, I may or may not read this book for this square. I'd really like to, of course. -- Mainly a Historical, I suppose. -- This category is wide open. I've already got several listed that I want to read, and it's probably another square for Tessa Dare's Spindle Cove... or something by Sherry Thomas or Amanda Quick. -- I might have a few freebies on my Kindle that would fit this one. -- This book is also categorized as Gothic. But according to the summary, this book involves a set of twin sisters, though one of the sisters is dead at the beginning of the book? If it doesn't work, I'm sure I'll be able to find something else. -- Yes, this is a long book, but I love Juliet Marillier and she DOES infuse a good amount of romance into her fantasy novels. Daughter of the Forest is a book loosely based on The Six Swans. Many reviews have mentioned that Daughter of the Forest is at the same time heartbreaking, and dark and passionate, and not for the weak of heart, despite the Happily Ever After that comes with it in the end. -- I own this book and have been wanting to read it for a long time. I assume that the main character being an events planner/wedding planner is an okay use of this square? Unfortunately, now that this book has become Book #2 in a series, I may have to reconsider. I really, really don't like when that happens, and you think you're reading Book #1, or a stand alone novel, when the author or publisher suddenly decides to insert it into a series, NOT as Book #1... >.< I know... it's a Harlequin thing and I can read this book as a stand alone... but it still bugs me. -- Jill Shalvis books will definitely make it into this Bingo game. And the title says it all, no? -- This category will take some looking into... or just whatever I happen to end up fitting this square. -- I need recommendations for this one. I really do. -- When I mentioned that Jill Shalvis will be inserted into this Bingo game, I wasn't kidding. Pretty much any Jill Shalvis contemporary will fit this square, I think. -- This category might take some looking into. -- Another 2017 Reading Assignment Challenge book. And also a book I've been interested in reading for some time now. And there we have it! Romance Bingo 2017! Almost ready to roll, but I'll play it by ear... or by read... whatever.